Behold & Reflect: Living Artfully: Reflections on "A Million Little Ways"
Living Artfully: Reflections on "A Million Little Ways"
I just finished Emily P. Freeman's new book, A Million Little Ways: Uncover the Art You Were Made to Live, which intrigued me because I've been going through a season of trying to live with a more purposeful, deliberate mindset. Freeman's premise is that just as God is the Master Artist who created the universe and you and I from the dust of the ground, we are made in His image as both his masterpiece (Ephesians 2:10) and as his co-laborers that create the art of declaring His glory when we live full, abundant lives in Him. She also briefly points out the original Greek for "masterpiece" is "poiema," the root of the modern English word "poem." This is not a scripture heavy read, but her thoughts flow from this biblical insight in a way that could inspire readers out of a ho-hum, hum-drum existence into a freedom to pursue the skills and creative endeavors that make them feel "fully alive." The book is broken into three parts, with the first part explaining how she defines the artist and artwork, the second part offering exercises to uncover your inner artist and preferred medium, and the third gently nudging you toward unselfishly making art regardless of your misgivings. While "art" is in the tagline of the book, Freeman tries to be inclusive by stretching the definition to include things like calculating, doctoring, train building, mothering and other skills that don't necessarily seem very artsy. I appreciate that the author wanted to inspire even those who never liked art class, but I don't think she needed to try to convince such a broad audience. The majority of readers interested in this book probably already have some aspirations to traditional artistry- be it cooking, woodworking, storytelling or crafting. I also found that trying to apply the artist metaphor too broadly made it harder for me to really uncover my own God-destined artwork. As a mom of three, when I read that mothering is included in valid artistic endeavors, I initially felt a little deflated and discouraged from pursuing my lofty, crazy ideas (currently, to write and illustrate one children's book each year and to get this blog up and running enough that people will start sending me free books to honestly review :). I'm passionate about my kids, but should mothering be enough for me? However, further reading found me nodding my head in agreement with Freeman once again. In particular, Freeman proposes on p. 40 that there isn't necessarily One Big Thing you or I were put on this earth to do, other than to glorify the One whose image we bear, and we do this in many ways, if not millions of little ways each day throughout our lives. I love this concept. It takes the pressure off me to produce something for my own glory and it helps me see each task as an important opportunity to live fully in the moment and fully for God. As I mentioned earlier, the book's second section suggests various ways of discovering one's hidden artist potential. Freeman uses examples from her own journey as a writer to show how we can find clues in our childhood dreams and preferences, remember our source in God, face our inner and external critics and take our craziest ideas seriously to ultimately uncover the art bubbling beneath the surface of our lives. Two decades ago, when I was a teenager falling in love with Jesus, I would have never imagined that I was supposed to stir up those inner longings to create. My Christian upbringing was of the variety that discouraged introspection and cultivating one's identity apart from Christ. Even as a grade-schooler, I knew I was good at writing and enjoyed art, but I chose to pursue a college degree in biology because it seemed so much more practical and less likely to seduce my soul away from my First Love. Though I eventually ended up a writer (via an extremely circuitous route that took me to Asia and back), I often wonder what would have happened if I had felt the freedom to cultivate and cherish my God-given identity and skills from the get-go. 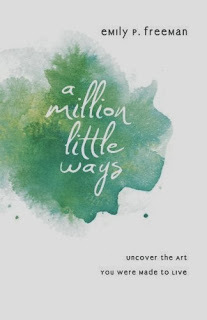 I wish a book like "A Million Little Ways" had existed for me back then. In the third part of her book, Freeman discusses the many distractions opposing our newfound decision to take a go at making art. In addition to issues with self-confidence that might preclude us from saying "yes" to the task God's laid out before us, Freeman discusses the problem of not being able to say "no" to obligations that force us to put off more creative endeavors. Furthermore, Freeman argues we should view limitations, such as time or finances, not as signs to hold off on creating, but as challenges to fuel creativity. After all, didn't God limit Himself in a human body in order to do His great work on the cross? The real art is the invisible work happening in the depths of my soul as I uncover, sink, see, listen, and wait. The book is just the souvenir. There is hope within you too, a desire longing for completion. It may not be a tangible work you can hold and point to. Your souvenir may be a relationship, an education, an investment, a charitable cause. As you stare at the stone of the hoped-for souvenir, remember the deeper work happening within you, where your life is hidden with Christ in God. Having this view makes the pursuit of art not for art's sake seem more than worthwhile-- it seems to be what we were all made for and commissioned to do. If you are a surgeon or a dentist, we want your bag of skills. Use your training and your technique on me, I've got a cavity. But if you are a friend, leave your bag at the door. I don't need an expert. I need an artist. I need someone who will be willing to show up and let me be a mystery, someone who will appreciate me as a fellow image bearer, someone who looks to Jesus as their ultimate security and doesn't need me to be okay so they'll feel better. I long for someone to be willing to ask me questions, not for the sake of knowing the answer, but for the delight of knowing me. I echo Freeman's longing in my own creative journey and aspire to be such a generous friend to others so we can all express the little sparkling facet of God we were made to reflect. I heartily recommend this book for someone who feels a little aimless in their Christian walk or who might be pent up and discouraged in a church setting that looks down on non-conformity. The book is written in a meandering style, which despite being organized into several sections, chapters and subheadings, might feel a little disorganized to those looking for a clear how-to-be-the-artist-you-never-dreamed-you-could-be manual. But, if you're like me, and you appreciate an author who humbly shows vulnerability in her writing and don't mind mining through slightly rambling prose on a hunt for gems of wisdom, then you'll be rewarded with plenty of nuggets to encourage, enlighten and inspire you. Hi, Marci! Thank you for commenting :) Yes, I think Freeman also wrote a book called "Grace for the Good Girl," which I haven't read yet either! You'll have to send me your home address. My email is my full name, no dots or underscores, at yahoo.com.